Audie Cornish Will Fill In For Michele Norris On 'All Things Considered' : The Two-Way Norris has stepped aside during the presidential campaign because her husband is working for President Obama's re-election effort. Cornish is currently host of Weekend Edition Sunday. Weekend Edition Sunday host Audie Cornish will be filling in for Michele Norris on All Things Considered for a year, starting in January, NPR just announced. As we reported on Oct. 24, Michele is stepping away from the host's chair through the 2012 election because her husband, Broderick Johnson, has become a senior adviser on the staff of President Obama's reelection campaign. Michele will be doing some reporting and projects, but will not be involved in NPR's coverage of the campaign. Audie took over the host's duty on Weekend Edition Sunday following the retirement of Liane Hansen earlier this year. "While it was a tough decision to move Audie (albeit temporarily) from a program she has quickly made her own, her skills and experience make her the ideal person to step in. 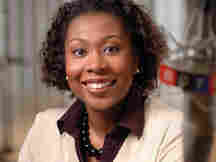 She is a warm and familiar voice to NPR audiences and an outstanding journalist and storyteller. Audie will be a wonderful complement to Robert [Siegel] and Melissa [Block]. And, in an Election year, her experience covering Capitol Hill and the 2008 presidential election will be a huge plus." An internal search is underway for a one-year fill-in for Audie on Weekend Edition.